Some applications need the input current to be controlled, to prevent high current spikes when power is first applied. This could be to reduce damage to switch contacts by the risk of sparking. Clearly the inrush techniques just described could be used, but sometimes it is necessary to control the output power instead. For example, a circuit for driving one or two power LEDs from the AC mains could use a double-buck topology. 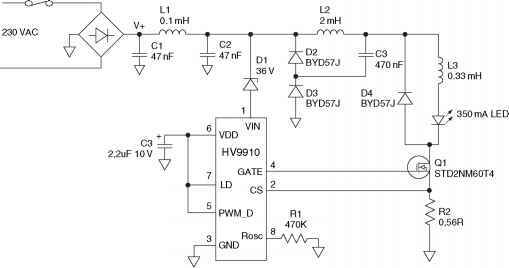 But typical applications for this circuit are inside lamp housings, where an electrolytic capacitor cannot be used because of short lifetime or physical size. But using a polyester film capacitor means that the voltage dips between switching cycles; since the output power is normally constant, this means that the input current will peak as the input voltage dips. The peaks in input current give rise to considerable EMI and mean that the power factor is very poor. If the output current was controlled, i.e. 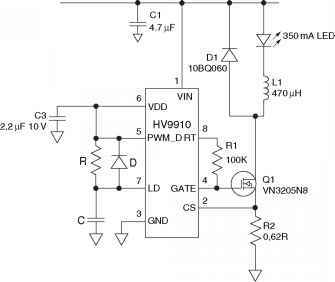 reduced as the supply voltage dipped, the input current would remain constant when switching. The addition of a Zener diode in series with the supply to the controller IC would further improve the power factor. Figure 10.8: Soft-Start with HV9910B. and grows as the capacitor charges. Clearly a method of discharging this capacitor is needed when the power to the IC is disconnected - a diode to the Vdd could be used to reduce the discharge time, see Figure 10.8.